Cry Havoc’s charity of the year. Morris Dancing is, we have to admit, an eccentric way to have fun. But there’s more to Cry Havoc than just fun. From the outset, we’ve collected each year for a local charity. Our charity for 2015 was the Oxfordshire Multiple Sclerosis Therapy Centre. We’re proud to announce that this year we’ve raised £1000 for a cause that has touched the lives of several Havocs. This coming Thursday, November 17th, we are presenting the cheque to the Centre. 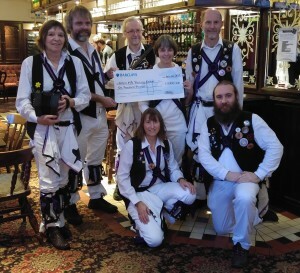 This afternoon a few Havocs gathered with the cheque for the benefit of the local press. Look out for our announcement of our charity for 2016 in the New Year. This entry was posted in Charity on November 14, 2015 by Jim Hague.